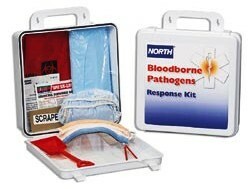 North Bloodborne Pathogen Response Kit 019740-0027 has the same contents as the 019746-0032L except it comes in a larger 24 unit size box. It is a very complete Bloodborne kit with the contents to clean a spill containing bloodborne pathogens as well as PPE (Personal Protection Equipment) such as a gown and shoe covers necessary to protect employees in accordance with OSHA 1910.130. The kit needed to refill this bloodborne kit is North Refill Kit # 127010.